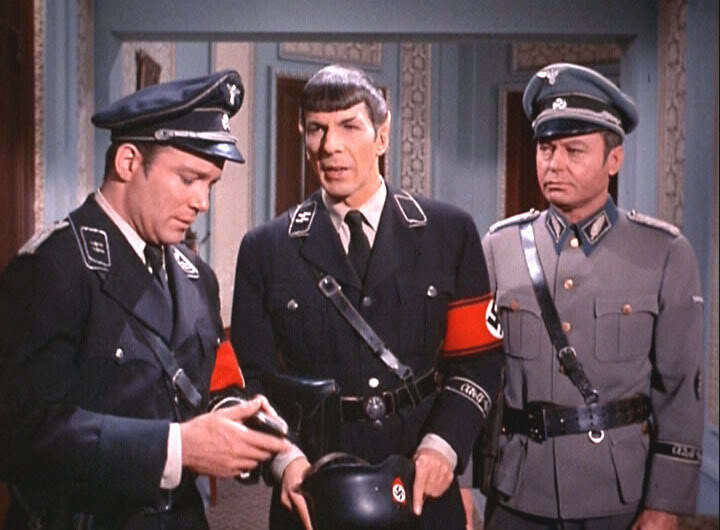 “Patterns of Force,” otherwise known as the “Nazi episode” from Season Two of Star Trek, has finally been shown on German television, more than 43 years after it originally aired in the U.S. The episode, which is one of those “alternate history” shows in which some far-off planet only gets part of Earth’s history and then runs with it (like the planet-of-the-gangsters episode “A Piece of the Action”; I’ve come to refer to these as “dress-up” episodes), finds the crew of the Enterprise landing on the planet Ekos, which is essentially overrun with Nazis. One could understand why Germany might still be a bit sensitive about such an episode back in February of 1968. Apparently, the show was available on German pay TV in the mid-90s, but finally aired late at night on regular German television some time last week. It’s a positive thing all around: Germany is willing to confront issues of representation when it comes to the greatest atrocity ever committed AND German citizens can now finally see every episode of Star Trek. It’s also worth noting that more than 40 years after debuting, Star Trek is still in constant rotation AROUND THE WORLD. Not many other shows can make the same claim. I want to say good job, Germany, but only as it pertains to still airing Star Trek. The other stuff not so much. ← Will Benicio Del Toro Play the Villain in Star Trek 2 (Which Won’t Be Called Star Trek 2)?